Alastair Humphreys is a record-breaking and award-winning adventurer. In 2012, National Geographic named Alastair as one of their Adventurers of the Year. Alastair has spent years tackling adventures that are simple, but not easy, and values the crucial difference between those two words. whether it’s cycling round the world for four years on a budget of £7000. rowing the Atlantic Ocean with three strangers. breaking his foot on the world’s toughest ultra-marathon (but still finishing the race). walking across India, hauling a 350kg cart through the Empty Quarter desert. busking through Spain with no money or credit card. …or even walking a lap of the M25 motorway round London! 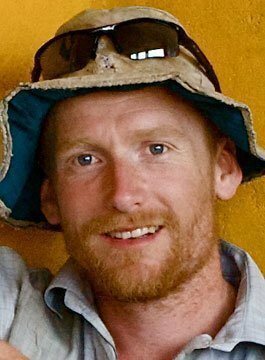 Alastair Humphreys is a very popular motivational speaker who shares his experiences through a presentation crammed with adventure and stories relevant to anyone. The lessons he learnt about himself in the world’s wild places are accompanied by striking photography and humour. His talks to diverse audiences are original, down to earth, quick-witted, self-deprecating, honest, energetic, positive and challenging. His expeditions provide a spectacular, original case study of self-motivation, setting small targets to achieve outrageous goals, the rewards of risk and teamwork, the power of story-telling, overcoming difficult times and self-doubt, the magnificence of our world, and a call to arms that nothing is achieved without being bold enough to begin it. Though he tells stories from all around the world, Alastair takes care to emphasise that he is a normal person, just like everyone else, and audiences therefore relate to him exceptionally well. Alastair entertains groups, makes people believe in themselves, and offers a polite prod to do something extraordinary with our time. As well as the major adventures, Alastair’s has developed the award-winning concept of microadventures. These short, adventurous journeys close to home, encourage people to take practical steps to challenge themselves by undertaking their own adventures, helping to improve their physical health, mental well-being, and all-important work/life balance. His inspiring message, light-hearted, yet compelling, reminds people what “difficult” really means and that we are all able to achieve great things. "Fast-moving, inspirational and humorous and left our colleagues wanting to hear more about the incredible personal achievement of mind over matter"
"Incredible and inspirational. The response from everyone has been amazing"
"At one of the best conferences we have ever had, you were seen as one of the highlights. The story is inspirational, told in a delightfully unassuming way"
"You were an inspiration to everyone here and many said that you were the best presenter that we have had, ever!"